I was waiting for the drive up teller at my usual stop in front of the public library. The smoky glass of the waiting stand shielded my anxious gaze. I was in a hurry this time. I needed cash now before anyone else bought that dog. Hurry up; hurry up, my drive up teller. Actually there are a number of drive up tellers in town, but I was hoping for the one who drives the low-rider turquoise Chevy. He is a young guy, slick backed hair, dressed in a wide lapel suit jacket on chilly days and a white polyester shirt with the sleeve rolled up for a place to tuck his cigarettes on hot ones. Not that he smoked them in the car; it was against regulations. The clients after all slide into the passenger seat as they conduct their banking transactions with the drive up teller and might not appreciate a smoke-infused car. Of all of the drive up tellers, he would be the one excited about the dog. Back when the program to hire the drive up teller positions began, the intent was to find employment for the young people in town who liked cruising in their souped-up cool cars, but remained unemployed due to their apathy towards finding a desk job. The idea was good one. This is how it works. Drive up window tellers were a breakthrough innovation in the 1980's. I remember the year because my Uncle Ted was so delighted with the first drive-up window in Palisades, Colorado that he arrived at the bank early. Dressed in his pajamas ready to do business from the privacy of his car. Kind of like going out to get the paper in PJ's, but even better. The thought of it thrilled him. The bank teller was a little surprised. Bankers are a staid bunch for the most part, but by accident a few bankers fell into the trade maybe having married into a banking family. These creative bankers rose to the top and their creative genes leaked out in ideas like drive-up windows and drive up tellers. I'm so thankful that they did. Back to the dog. I'm not ordinarily impulsive, but I don't volunteer at the Humane Society, because I have so little control when it comes to cats and dogs. But this dog just looked at me over the edge of the box with such longing that I couldn't stand it. She was a border terrier. Ordinarily a hot commodity dog. Not common here abouts. But I know borders, sweeties all of them. She was in a cardboard box on the sidewalk corner at Palouse and Alder. $10. Good price. The shabbily dressed gentleman said that he would sell it to the first person that had $10. Cash. He seemed to be in a rush to get out-of-town or at least move his body to a less conspicuous corner. I knew that dog wouldn't last long. Hurry up, drive up teller. I usually carry cash with me, particularly since I just refinanced my house and I have a cushion again. Now that is another good story. When I talked to the banker about a loan, he suggested that I was eligible for a drive by appraisal. I was thinking, "Oh no, another creative banker. What does he mean a drive by? Will I need to duck?" The banker assured me that this was for real. The appraisers wouldn't have to come inside like the usual appraiser, measuring rooms, looking askance at your decorator schemes and reassuring you that the neighborhood wasn't that bad. As an introvert, I liked the idea. Then I began thinking of all of those bushes that didn't get trimmed for months while I was traveling. The leaves were sticking out from under them, their unkempt crinkled brown edges blabbing that they had been left to overwinter. They said, "You think the yard is ill kept; you ought to see the house." I had some work to do to prepare for the drive by appraisal. I called the banker again and checked to see if I would know when the drive by would happen. I got an uncertain answer. I think that I was hoping for the exact hour. I could stand outside in my swanky blue dress with the yard looking tidy. I might as well be in the photo too. I got to work clipping the bushes. I wanted them to stop waving at the traffic with their skinny skewed branches. 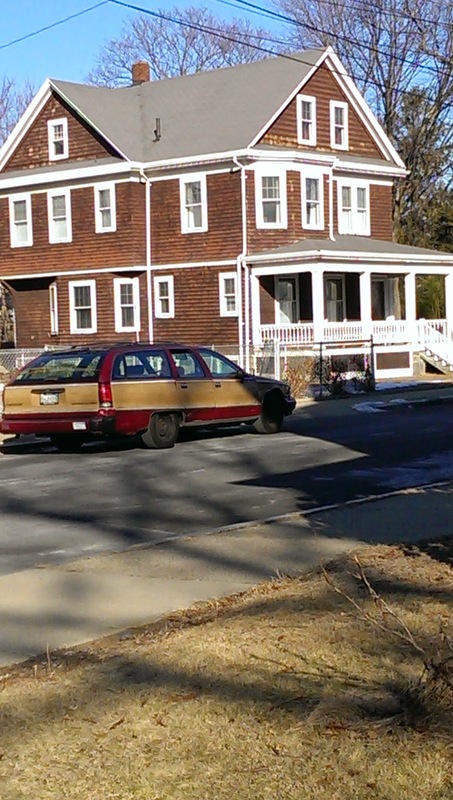 This is the kind of car, big old station wagons, drive by appraisers likely use as their official vehicle. They need a car big enough to haul everyone. Now I didn't ask about this for sure, but I think this is how it works. The drive by appraiser needs to have first a driver. The appraiser can't do the driving and assess adequately while the car cruises by the house at a legal speed. The appraiser has a form to fill out, so they need to take in as many details as possible during the drive-by and not be distracted by keeping the car on the road. The photographer needs a window seat of course. The psychic can sit in the middle. The psychic doesn't actually need to see the house; they just need to get near it. They come along to check for ghosts. Haunted houses don't seem to do well in the real estate market. Now then there needs to also be a seat for the fortuneteller. She needs a comfortable wide seat for her voluminous gown with a drop down tray for the crystal ball. She is actually one of the most important people associated with the appraisal team. She can predict such things as will the owner live a long life and therefore be able to pay out on a long-term contract. She fusses with the prediction about romances and what they mean. Will there be children from a romance? Will they be good children or will the house one day, when the kids become teenagers, become a drug-dealing house? The fortuneteller has a lot of responsibility. Now the gambler is sometimes also the banker, but sometimes he is just a professional gambler. These professional gamblers get called in for the ride on high stake properties. The banker comes along mostly to get out of his office and get some fresh air. So I got the dog. The drive up teller in his turquoise and white Chevy not only cashed my check, but he drove me back to the corner of Palouse and Alder. He wanted to see what kind of dog a border is. Drive by tellers. Good guys. I just wish that I could have had the dog for the drive by appraisal. She would have looked so cute in that photo with me smiling winningly, her cuddled in the curve of my arm in front of the house. The fortuneteller would have laughed at the sight.